The Dealz retailing concept is simple, they offer a wide range of products, including many well known brands, and local brands for €1.50. In addition there are a number of special promotions at key price points such as €1 and 2 for €1.50. Their flagship store opened at Westend Shopping Park in September 2011. The competitively priced, breadth and depth of range, top brands, as well as local Irish products has added to the brands success. As well as offering a mix of known brands such as Kelloggs, Cadbury’s and Kodak, the stores will also sell locally sourced products including milk, eggs and crisps. By following a simple pricing strategy, Dealz aims to bring great value to their Blanchardstown customers. 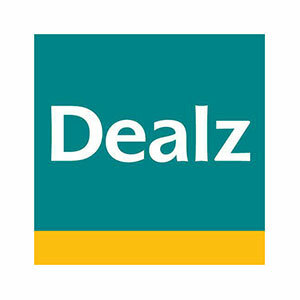 Every week, millions of savvy customers enjoy the fun and exciting shopping experience of Dealz. Their quality, variety and inflation busting style offers irresistible value on each visit, enabling customers to benefit from its famous ‘amazing value’ proposition. It is undoubtedly the efficiency of Dealz management systems, wealth of buying and selling experience and a flair for recognising the needs of the customer which places the company ahead of other retailers in the sector. It is those same characteristics that guarantee Dealz a major role in the future of modern retailing. Offering amazing value with a wide range of products, including many well known international and local Irish brands from just €1.50. In 2018, Pep & Co launched at Dealz, offering unbeatable value on clothing and accessories for the entire family. They firmly believe in keeping things simple and fuss-free in order to keep their costs low- this in turn keeps prices down for customers, so that you can spend a little, get a lot. Their prices are ingenious and so are their ranges. With a selection of sizes, colours and fits to suit the whole family & even the stylish touches you need to PEP up your home.